Every summer millions of travelers visit Southeast Alaska via cruise ship. 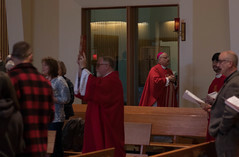 For the many Catholic visitors who are in port cities on Sunday the port ministries in Ketchikan and Juneau make it easier for travelers to attend Mass. 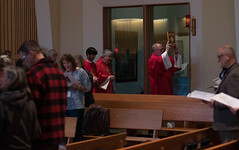 Since cruise ships started making stops in Ketchikan in the 80s Holy Name Parish’s “Port to Pew” ministry has been bringing people by the van load to join them in celebrating Mass. On a recent Sunday visitors from Chicago, Philadelphia and California were happy they could attend Mass when their cruise ship stopped in Juneau. To promote the service offered through the port ministry, Morgan added lettering that says “Free Rides to Mass” to the side of the bus this year as well as the image of the Nativity of the Blessed Virgin Mary that can be seen on the stained glass in the Cathedral. Morgan keeps track of how many ships are in each weekend and starts picking up passengers for Mass about an hour before each service. Travelers will also contact her ahead of time through email or by phone, which is listed on the Cathedral website, to let her know which Mass they plan on attending and for information on where the bus will pick them up. Occasionally, Morgan will notice people making the trek up the hill to the Cathedral and stop to offer them a ride and let them know about the free return service to the port after Mass. If you are traveling to Ketchikan or Juneau this summer and would like a ride to Mass visit www.holynamektn.com/church/visitors.php (Ketchikan) or juneaucathedral.org/visitors/cathedral-transportation/ (Juneau) for more information.